Forget ocean world, forget paying $300 to swim with dolphins or pet the sting rays. Our girls did/do it all for free, and a very regular basis. (Arias actually came to call the stingrays her pets since she would go feed them daily and explain to other tourists how to handle the animals!) Tonight I found myself going through our old pictures and came across so many fun ones of this aquatic friendship. Here are a bunch of them, and a couple of videos, of the ocean creatures that our girls have had the privilege of playing with. Arias has come to prove herself much braver than her Mama in many situations. And Ellia, well she seems to take a little more after me in this regard! And then sometimes we make our own little sea creature friends! don't worry we'll keep going until the bank account runs dry! 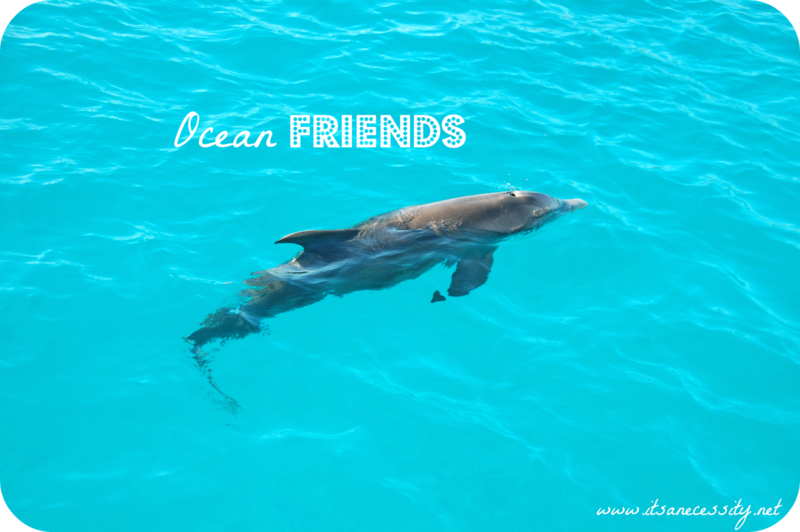 Bahamas have an abundant sea animals! 🙂 Would love to go there someday! Holy cow. I have never seen a starfish that big!! WOW. They are super heavy too! Wow, there Giant Turtles, Sting Rays, Sea Lions and Star Fish. That looks really fun for the kids. The girls love it. Arias actually used to tell everyone that those stingrays were her pets! Your life reminds me of that book Swiss Family Robinson. Totally awesome. Do you think you'll ever go back to civilization? "civilization" yes I am sure, we visit our family and friends in Canada every couple of years and love it but I don't think we would move there. We are thinking of buying property somewhere a little warmer! Like the DR or somewhere in central america, so it will be civilized but maybe not to everyone's standards! I am so jealous. I would love waking up to the ocean on a daily basis. I love starfishes, I think they are magical. I also love the flying fish. I'm going to have to do this one day. Those flying fish were literally just jumping right into the cockpit of our sailboat, it was crazy! She used to call them her pets and teach all the tourists how to touch and feed them, it was pretty impressive watching our 2 year old (at the time) do that. What a delightful beach trip! 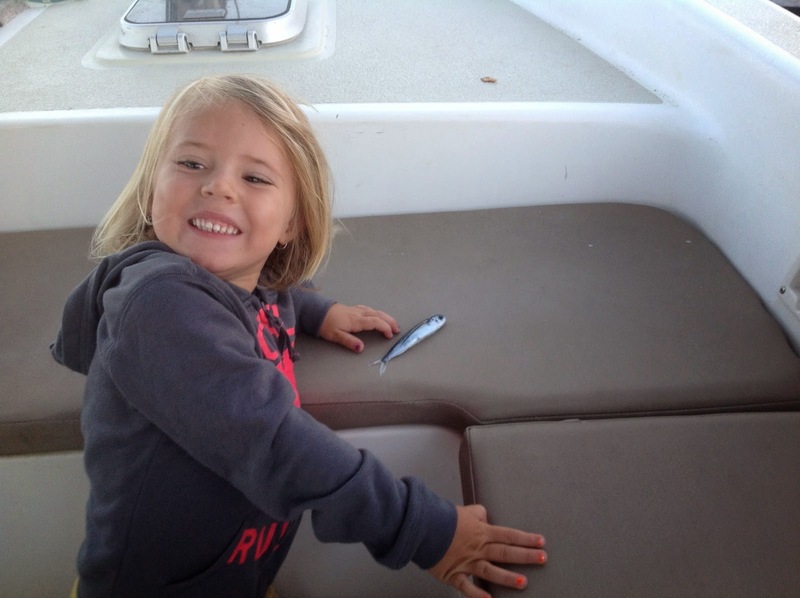 I love that the kids were able to touch the sea animals! Arias, our older one, has no fear whatsoever, if we tell her its "friendly" she will try to hold it and have it as her pet. 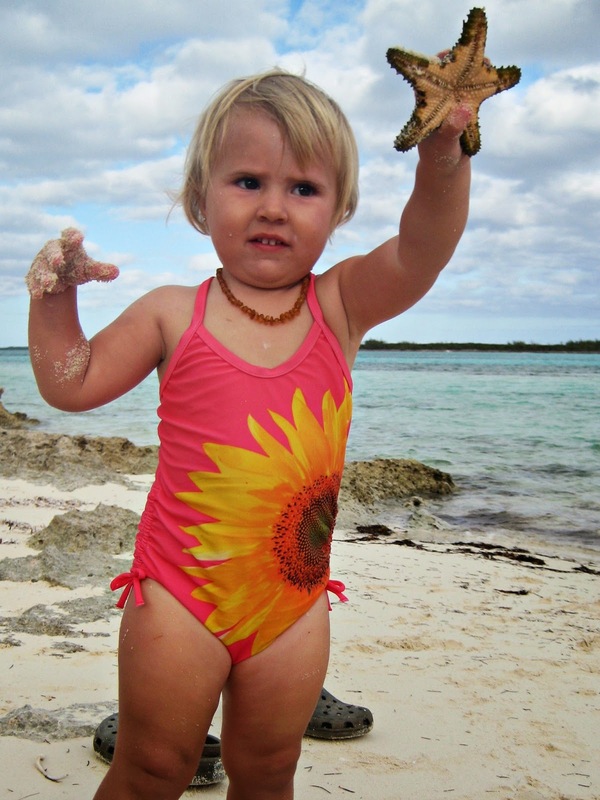 My daughter is obsessed with turtles, so she would have wanted to take it home. Lol! I grew up at South Padre Island, so my love for the sea is intense. Sadly we live inland now so we don't get to vivist much. :/ Great post, and amazing pictures! Now I miss the beach. That starfish is huge! I love all your pictures. I've been to the Bahamas and it's so tropical there. I enjoyed it! Absolutely adorable! Who needs a zoo or water park – there is one right outside your window! Living life! I love this. What an amazing way to truly LIVE with your beautiful family! Gorgeous photos and family memories. I love how much you have traveled with the kids and I also love the star fish. Gorgeous colour. When we got pregnant the first time we decided that we would take the girls where ever we went, and that we would not stop traveling merely because we were going to have kids, and it has given us some amazing opportunities to see the world through their eyes. Wow what lovely pictures! Your kids are going to love having such wonderful experiences! It is funny, now that we are visiting Canada, how much they know about the tropical life, but how little they know about things like hockey rinks and snow storms! You are giving your children such wonderful experiences! I would love to be able to do these kind of things with my kids but I just remind myself that I am giving them experiences too. They're just a different kind! How amazing is all of this?! I don't think I've ever seem swimming pigs or such a huge starfish before! The swimming pigs were slightly scary, for me anyways, I did not want them coming too close to our dinghy! Those are really amazing experiences! I'm so glad that my son has the chance to grow up here in the Amazon basin. The experiences are something that will be with him the whole life. That would be a pretty amazing place to grow up in too. Oh wow, these photos are amazing! I love sea life and the bahamas. This is going on my bucket list now! We spend a lot of time playing explorers and walking through the bush seeing what we can discover. Wow, what a huge starfish! it's bigger than your daughter was! You definitely lead a different, more fulfilling lifestyle! That last one is from some of the projects I do with the girls to keep them busy while we can't be by the ocean! How cool is that? I love dolphins and turtles. Dolphins are such amazing creatures, it was so much fun seeing them play around our boat. I felt like a kid again! Wow! Those pictures are awesome! How cool to see all of these animals up close? extremely cool, and sometimes slightly scary, because some of them are bigger than our daughters!